"The December 2009 Daring Cooks challenge was hosted by Simone of Junglefrog Cooking. Simone chose Salmon en Croute (or alternative recipes for Beef Wellington or Vegetable en Croute) from Good Food Online." I kind of quivered in my boots a little bit. Because see, not only am I not a big pastry eater, I'm also not a big pastry maker. But, I reasoned, that's exactly the point of the Daring Kitchen. To step out of our comfort zones. To go boldly where no (wo)man has gone before! Or so it felt. My experience in making this was quite positive though. It was fairly straightforward to make (and also a lot quicker than anticipated - bonus!) and I must say it did look quite impressive. Just the thing I needed for our 2 3/4 year wedding anniversary! It tasted good too - the salmon really shined and the watercress puree was the perfect partner to the dish. The only downside was that the pastry was super rich. Both myself and TheHusband couldn't finish more than half of our servings. Next time I make this, I would probably use filo pastry. If you're a big pastry person though, I guarantee you'll be all over this like a bad rash. 1. Sift the flour into a large bowl. Rub butter into flour until it resembles fine breadcrumbs. 2. Add salt and 2 - 3 tbsp of water, mixing to form a firm but pliable dough. 3. Knead briefly on a floured surface, then wrap in clingfilm and chill while filling is prepared. 1.Heat the oven to 200°C. Puree cottage cheese, watercress, rocket and spinach in a food processor to form a smooth sauce. Season to taste with salt & pepper. 2. Using a 1/4 of the dough, roll the pastry out approx 2 - 3 mm thick and large enough to cover one salmon fillet in it. 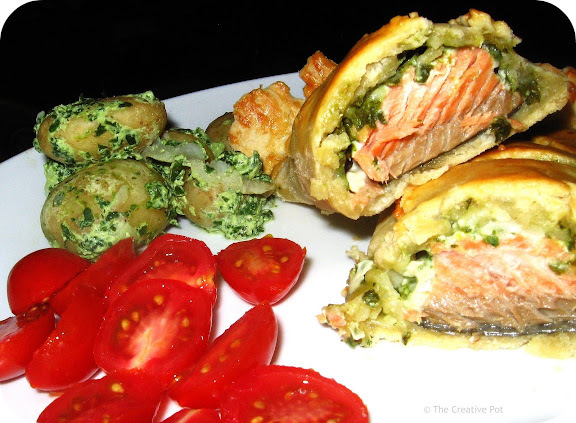 Transfer pastry to a greased baking tray, put one piece of salmon in the middle, spoon some watercress puree onto the salmon, then fold the pastry over to form a neat parcel. Repeat with the rest of the dough and salmon. There will be some watercress puree left over - reserve that for serving. 3. Make 3 neat cuts in each salmon parcel to allow steam to escape and make some decorations with the off-cuts to disguise the join if you like. Brush with the egg glaze. 4. Bake for 20 - 30 minutes or until the pastry is crisp and browned. Serve with the reserved watercress puree as a sauce. Beautiful! Bravo! I'd sink my hungry teef into it. Oooh - well done you! I've made salmon en croute a couple of times but never made my own pastry. Yours looks fabulous! Thanks Jeanne - that pastry made me quite nervous.